As a young lieutenant serving in World War II, Robert L. "Bob" McNichols vowed that if he came out of the war alive, he would put God first and make Him his partner. Pledges such as Bob's may have been common during wartime, but he meant and kept his. Bob McNichols' World War II U.S. Army Air Forces Bombardier Badge and war diary. On the morning of October 6, 1944, Bob, a U.S. Army Air Forces bombardier, departed for Berlin with eight fellow crew members in a Boeing B-17 Flying Fortress. Their mission was almost complete when a fleet of German planes interrupted their plans. The fleet took down the mighty aircraft as well as the precious life of every soldier on board, except Bob. As he would tell a newspaper reporter the following year, Bob did not remember much about that morning, nor did he truly recall how he survived. He described the thrill the crew felt when they spotted Berlin 30 miles in the distance. He remembered opening the bomb doors and concentrating on the approaching target. As the bombardier, he was alone in the nose of the plane when the Nazi fighters struck at 27,000 feet. "I didn't even know we were hit until I heard the bail-out bell," he said. "We must have gotten it in the wings. When I heard the bell, I released the bombs and rushed back into the body of the ship. Our navigator was lying in a passageway, badly wounded. I had to take off my oxygen mask to try to help him. As I bent over I collapsed, the air was too thin to breathe. That's all I know. That's the last I saw of any of the guys who were my pals." Bob lost consciousness when he removed his oxygen mask to help his injured comrade. The next thing he knew, he was lying on the ground staring into the muzzle of a farmer's shotgun. 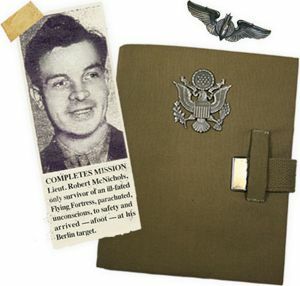 Bob believes he was a swinging target for Nazi snipers as he drifted, unconscious, in his parachute to the ground. "My uniform was full of bullet holes when I came to," he said. "They must have peppered me on the way down, but I didn't have a scratch." Due to the grace of God, Bob survived the crash that killed eight of his pals. "I was out cold and have no idea how I got out of the ship or down to earth," he said. "I don't remember pulling a rip cord, landing, or anything." Following discovery by the farmer, Bob was sent to prisoner-of-war camp Stalag Luft I, where he remained — eventually in the role of the camp cook — until his liberation on May 1, 1945. "Slept in my clothes all night. The Germans left at 1 a.m., and we took control of the camp. Woke up at 5 a.m. and started breakfast. Russians are 14 to 15 miles from here … we are still wondering when we will get out of here! Around noon Russians reported … and some of the boys saw infantry and tanks from the roof ... picked up New York on the radio this evening … thinking of getting home has upset me … I'm getting mighty impatient! The Russian advance scouts reached here tonight at 10 p.m.! German radio announced Hitler's death … had lights until midnight!" Bob was a survivor, and throughout the ordeal, he kept his faith. He dedicated his life to Jesus Christ and he held true to his pledge to serve the Lord in whatever he was given to steward. After the long wait, Bob returned home to America, his wife Phyllis and their six-month-old daughter, Barbara. Soon they would have a son, Eugene "Gene." In what some would call a coincidence yet others believed to be divine, seven years to the day after his release from Stalag Luft I, Bob founded McNICHOLS CO. When Bob began the business in 1952, he specialized in selling products with holes, Perforated Metal in particular. This focus led to the motto The Hole Story®, which also symbolizes the company's philosophy. Bob built McNICHOLS through sacrifice and survivorship. In the early days, the business was based in Bob's living room. He started sales calls early in the morning and worked on invoices late into the night. He operated the company according to a moral code and gave abundantly throughout his life. "To God Be The Glory" was one of his favorite sayings. He believed in the highest level of service, dedication to his employees, and appreciation for his customers he had the privilege to serve. After Bob passed away in 1981, his son Gene took over the leadership of McNICHOLS. Today, Gene and his family carry on Bob's legacy. At headquarters in Tampa, Florida, and at 19 Metals Service Centers across the country, McNICHOLS provides superior Service, Quality and Performance. A skilled staff, customer service tradition, and a nationwide network of Service Centers make McNICHOLS the industry leader. Every day we strive to fulfill Bob’s vision of unsurpassed customer service with honor.